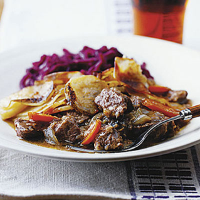 This hearty one-pot lamb dish, served with ready-prepared red cabbage, makes a great Sunday lunch. Preheat the oven to 150°C, gas mark 2. Season the flour, then toss with the lamb until well coated. Place a large frying pan over a high heat. Add 1 tablespoon of the oil and half the meat, and cook for 3 minutes or until well browned. Transfer to a 3.5 litre casserole dish. Add another tablespoon of oil and repeat with the remaining meat. Return the pan to the heat and add the stock and Worcestershire sauce. Stir for 1-2 minutes then pour over the meat in the casserole. Wipe out the pan then add half a tablespoon of oil, the onions and carrots and cook for 4 minutes or until they are starting to colour. Tip the vegetables in with the lamb, add the bouquet garni and season well. Arrange the potato slices on top, seasoning between each layer. Drizzle over the remaining half-tablespoon of oil and season again. Cover with a lid and place in the oven for 1½ hours. Remove the lid and cook for a further hour. Serve with Waitrose Red Cabbage (available ready shredded, in a pack). This can be prepared the day before and kept chilled. Reheat in a moderate oven until piping hot. For a crisp potato topping, place the casserole under a hot grill for a few minutes before serving. Try an ale with this classic British dish.